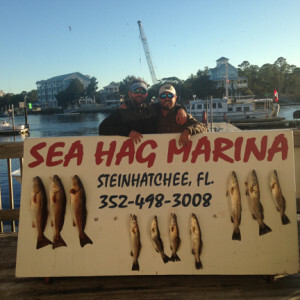 The weather has finally improved in spite of the national series of winter storms, and Sea Hag fishermen and -women have been finding lots of great fish. Even with the warming trend near the end of the month, trout have remained available in the river. As the temperature warms, the trout tend to move closer to the mouth of the river and on warmer days, they will move out onto the flats searching for food. Unfortunately, it’s still a little early for the heavy turtle grass that provides forage and protection for pinfish. However, when fish do move onto the flats with water temperatures in the mid to high 50’s, they are generally hungry. 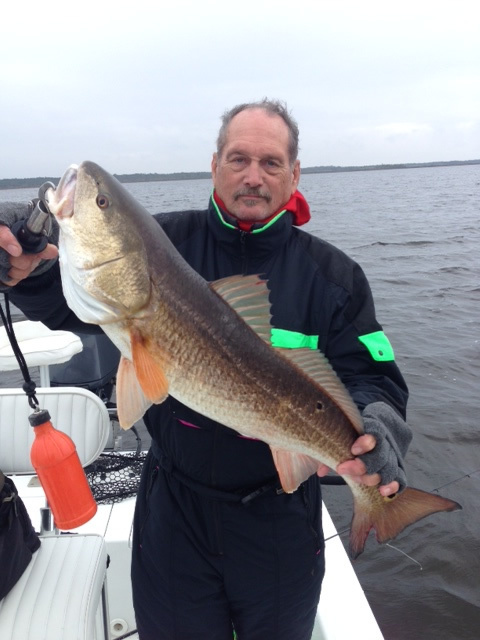 We have even caught fish on topwater plugs in water below 60 degrees, but fishing slow suspending lures or drifting Gulp baits or live shrimp under corks are also effective when you can locate the schools. 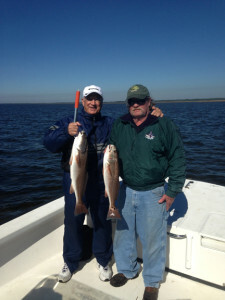 Redfish have still been scattered, although near the end of the month some schools of large fish were found, most about a quarter mile offshore of rocky areas. 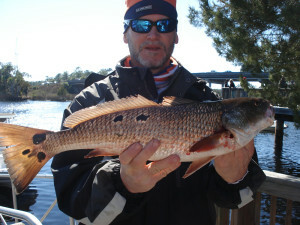 There are some excellent redfish in creeks in very shallow water and holes, but these are only accessible on low water to airboats and kayaks. 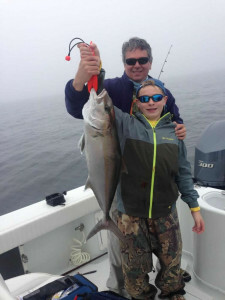 Offshore fishing has continued to be slow with the exception of some massive spawning congregations of black sea bass, some of the finest eating fish in our area. And just near the end of the month, the excitement rose as the sheepshead bite picked up. More about them in the forecast. So you want some sheepshead? David Sills came up with this fine specimen. 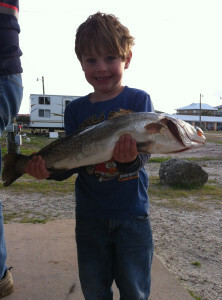 Corbin Mackey from Gainesville found this beautiful trout trolling in the river. 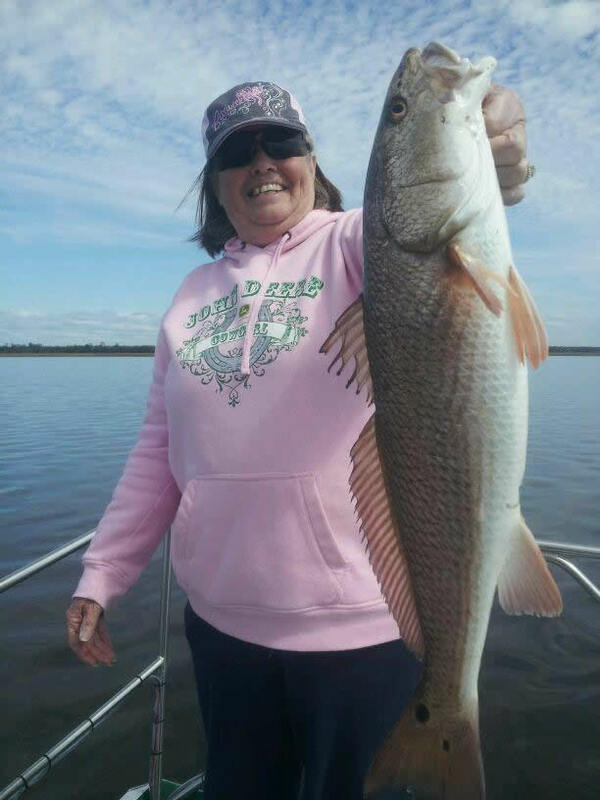 Debbie Singletary from Keystone Heights used Randy Harris’ airboat to find this overslot redfish. 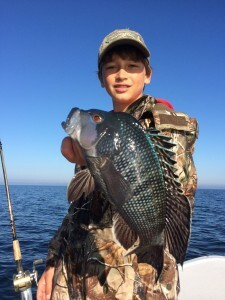 Chase Norwood fished in 30 feet of water to find a bunch of these giant black sea bass. 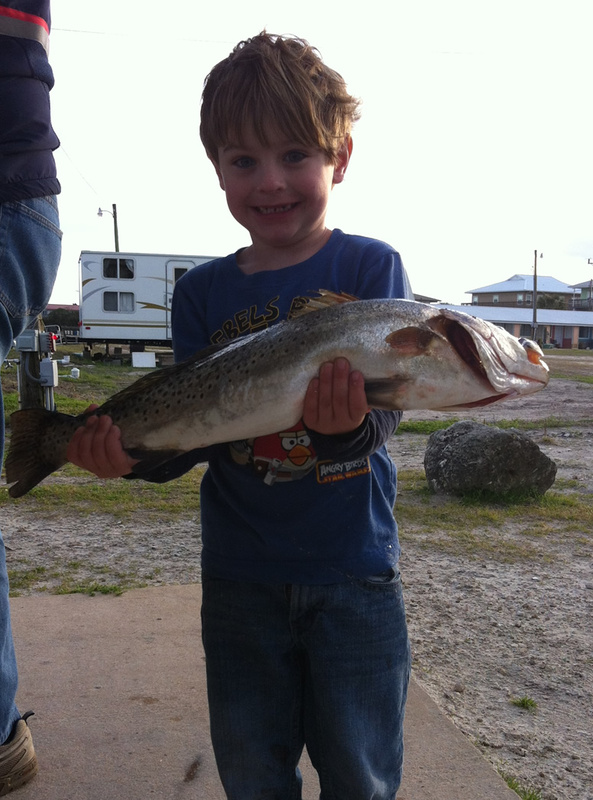 River Griffen from Georgia caught this fat trout fishing with his grandparents out of the Sea Hag Keaton Beach Marina. Phillip Evans, with his dad Phil, found lots of amberjack action offshore. Bob Barnett fished out of Keaton Beach and came up with this overslot redfish. 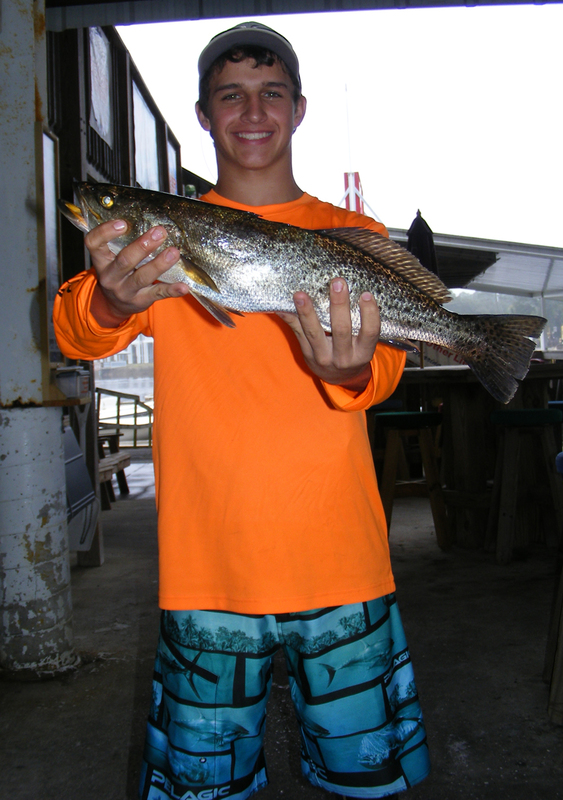 Brett Molzen from Bell caught this fine trout near the Steinhatchee River. 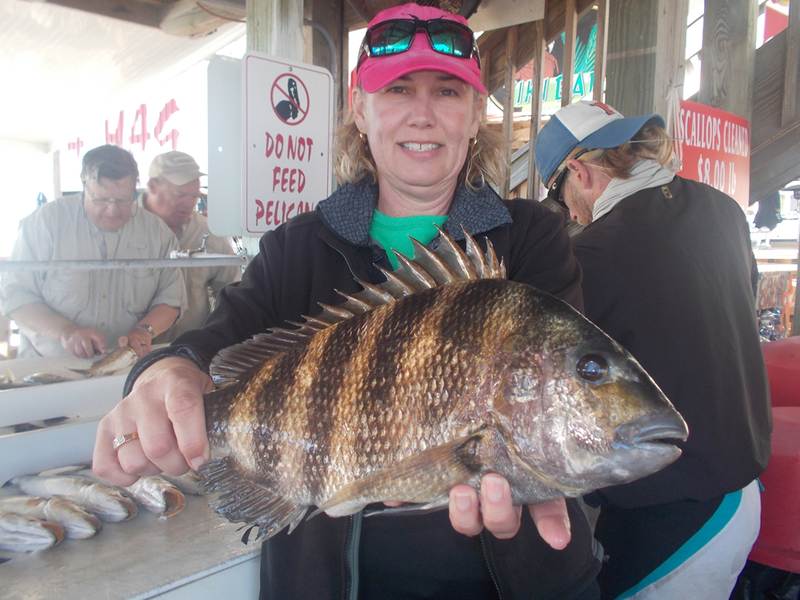 Another beautiful sheepshead caught by Liz Reed. This was the winning redfish in the “Lots of Spots” tournament, part of the Fiddler Crab Festival, caught by Kim Coffey. Continued warming temperatures will bring the flats back to life near the middle of the month. 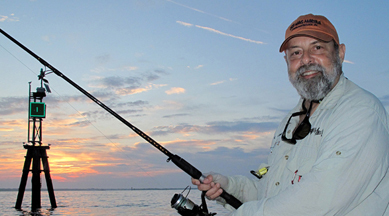 We might even begin to see some migrating Spanish mackerel and kingfish offshore. 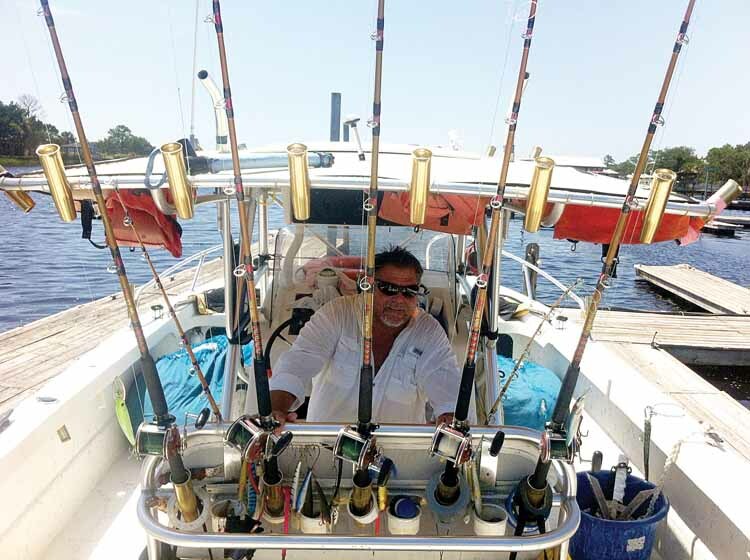 Red grouper, amberjack, and bottom fishing for black sea bass and Florida snapper will remain the staple of offshore fishing this month. 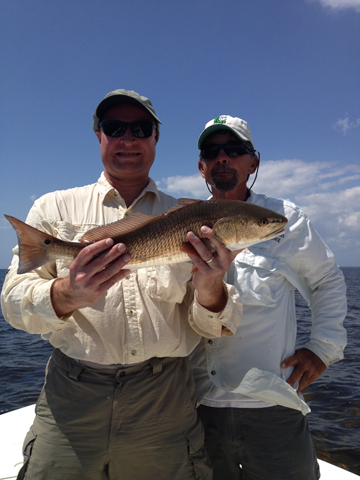 Inshore, redfish will continue to school in shallow water just offshore while solitary fish will remain in creeks and around rocks and bars. 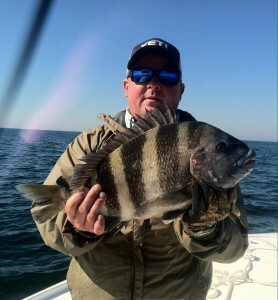 The sheepshead bite is picking up with good reports coming in daily now. A member of the porgy family, we have a unique fishery in the Big Bend area with the discovery that the largest sheepshead move to nearshore structure in order to spawn. And when they are in groups, sooner or later they get hungry. The smaller males usually arrive at the spawning areas initially; ranging from 2 to 4 or 5 pounds, they are usually catchable, but the real action begins when the females arrive. Weighing up to ten pounds or more, the females provide some excellent fishing in terms of great eating fillets and hard pulling. 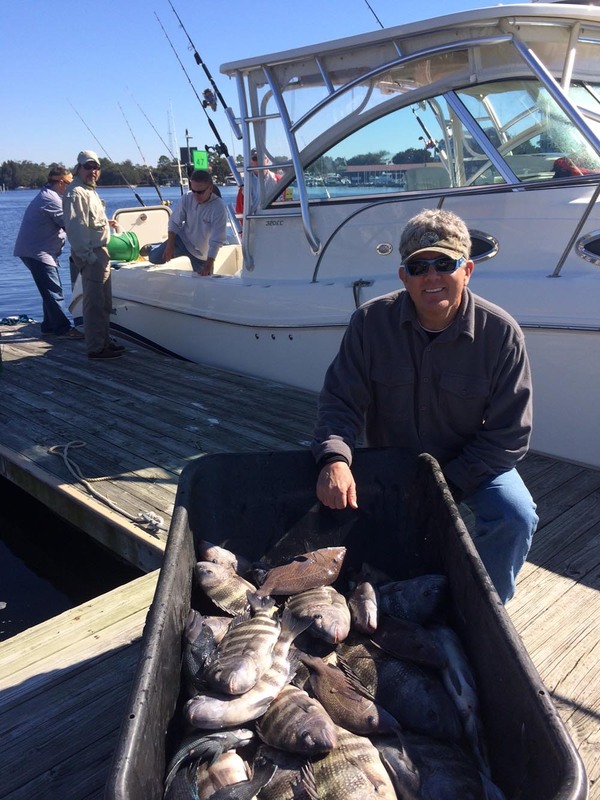 Any rocky structure in over 15 feet of water is likely to be holding some sheepshead, and while there are a variety of areas to fish, most are closely held secrets with the exception of the Steinhatchee Reef, which is about 8 miles or so almost directly west of the river channel. You can expect to have lots of company; sometimes the number of boats jammed into a small area rivals the river trout run. Careful anchoring is essential. The fish will swim in circles around the rocks, almost never straying away over the flat sandy bottom. You need to be able to drop your bait (usually either fiddler crabs or live shrimp) just above the rocks where the fish are holding. One of the great mysteries to all those who target these fish is exactly what seems to provoke the bite. 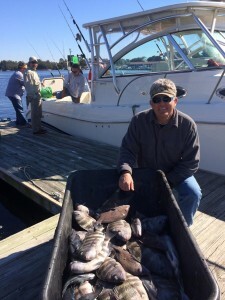 Much like grouper, you can see hordes of sheepshead swimming around with no interest in eating, and then all of a sudden they will turn on and you’ll have doubles and triples. One would assume it has something to do with the spawn (that can be distracting for almost all species, fish and otherwise) but it’s pretty hard to predict. Patience is the idea. Use a rod with some backbone as these fish can pull hard; there is a huge advantage to using braided line because of the very soft bite. While some people stick to simple fish finder rigs, with a sinker, swivel, leader and hook, I’ve always found it easier to select an appropriate weight jigh ead, based on depth and current flow, and attach a shrimp to it. I’ve also used a “knocker” rig, with no leader and the sinker free to slide right down to the hook. I try and dangle the bait just above the rocks. 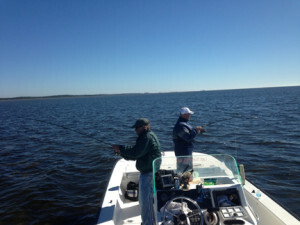 The bite is historically soft; just a slight tap on the line means it’s time to set the hook. While the fish are plentiful, they are frequently overfished, which is a problem during spawning. 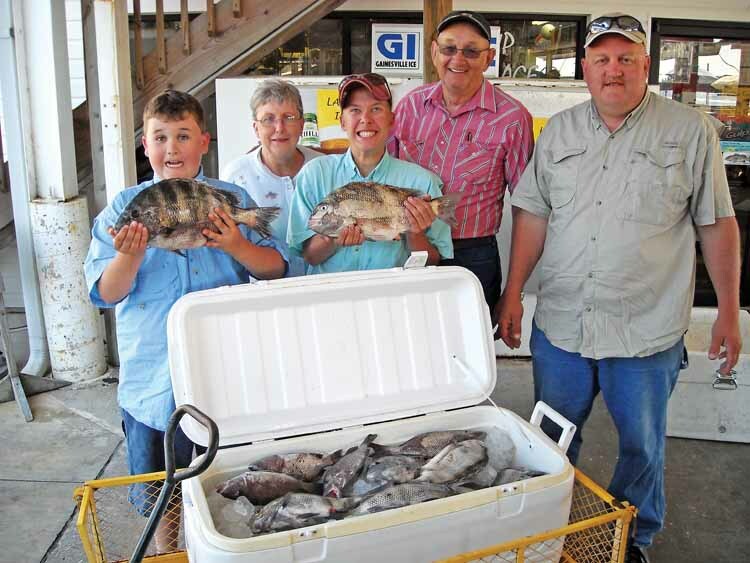 The limit per person is 15 fish over 12 inches in length, and even though they provide excellent eating, we need to keep the health of the fishery in mind and keep only the fish you intend to eat. March can be a very productive month in our area. It’s a time of transition as the water warms, and sometimes that requires some local assistance. You can get up-to-date reports from the Sea Hag Ship’s Store, along with live shrimp and pinfish and everything else you might need. 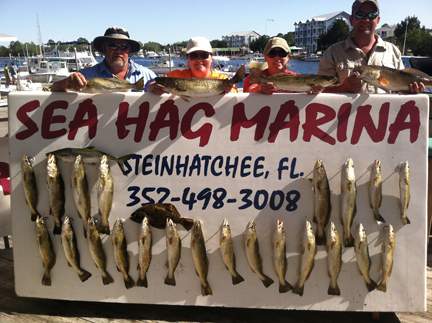 Consider renting one of the Sea Hag’s rental boats for sheepshead or inshore fishing. If you’re new to the area, consider also using one of our excellent guides. 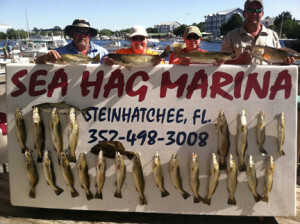 Most of them will do sheepshead charters as well. It’s not like it isn’t expected, but I’m glad March has rolled in. This winter has been weather-weird, hasn’t it? Strong winds and cold fronts followed by periods of Indian summer have kept us flipping the thermostat from heat, to off, to cool during the same day! Anyway, the sheepshead-spawning trigger has been pushed early, not full blast, but a few have set up camp at their regular romantic rendezvous. By the time of this reading, the sheepshead should be in full love-mode. It should be easy and fun to put ‘enough’ in the cooler while releasing the meaningful pregnant females. Best bait: shrimp or fiddler crabs. If kids are involved, at low tide, let them run down some fiddler crabs around the makeshift small boat ramps in the marsh around this area (bring a video camera). A helpful hint: file down the hook barb for ease of de-hooking. 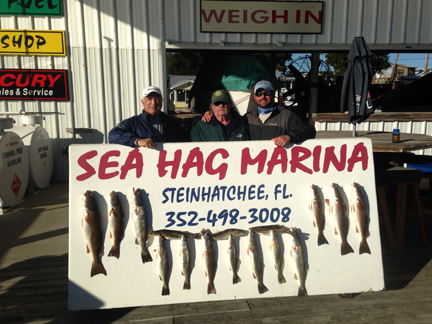 After sheepshead sport, ease off and collect some wonderful and colorful sea bass on any hard bottom from 20-40’. 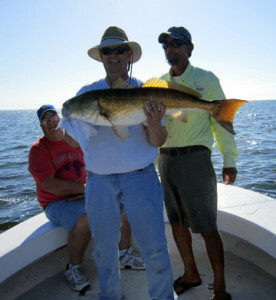 They are one of the best eating fish in the Gulf. Best bait: durable, such as squid, cut bait or pieces of Gulp. A good and easy rig is a ½ oz white bucktail jig with a baited hook tied above. To add more fun to both sheepshead and sea bass fishing, fish with light weight tackle. The loss of a fish or two is more than made for by the extra enjoyment. 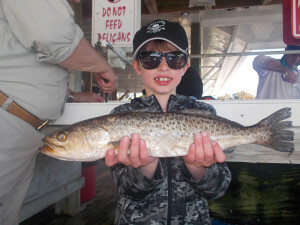 A kid, of any age, won’t remember the fish but will remember the rod bend and the super tug. Try and put more fun in the dysFUNction of fast catching. Red grouper are open year round now. When the water temperature is over 59 F, they should bang frozen baits with reckless abandon in waters approximately 60 feet deep. 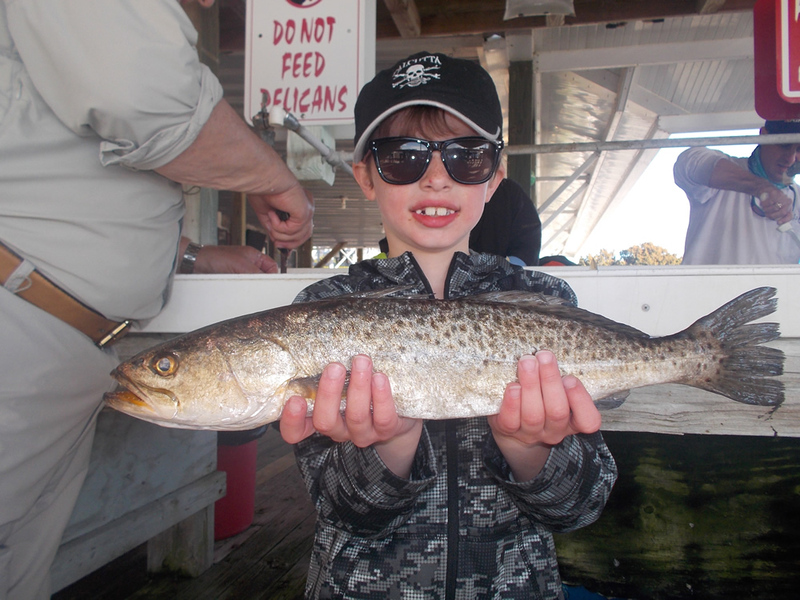 Too bad the feds have seen the need to close gag grouper for the recreational anglers. 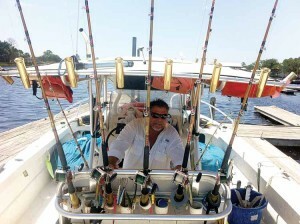 Trolling in the cool months is a great time, but is not selective or kind to caught fish. Final word: I’ll buy into the argument that folks in the US interior should have the opportunity to buy fresh commercial caught grouper when I see fresh elk, moose or antelope steaks in my local grocery. Steinhatchee and the waters of Taylor and Dixie counties consistently produce great catches throughout the year. On cold and bright sunlit winter days, we’ll target big seatrout and reds along the rocky shoreline using gold spoons or suspending plugs. But if it’s unseasonably warm this winter, we may even fish topwater plugs as the sun warms the rocks and shallow mud bottom. 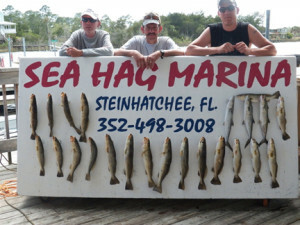 Steinhatchee is exceptional for the fact that we have relatively crowd-free waters and excellent marine services. 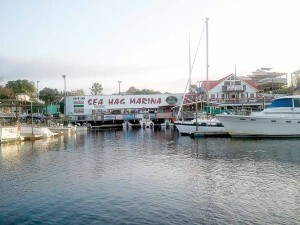 For those of you fishing with live bait, it’s available at the Sea Hag—along with ice, fuel, drinks and snacks.